Houndstooth is this winter’s biggest pattern. The oversized check, which was big in the 70s and can probably still be found in the back of your grandmother’s closet, has made a major come back. The classic pattern had been seen on the Fall 2011 runways of Stella McCartney, Alexander McQueen, Moschino, and more. 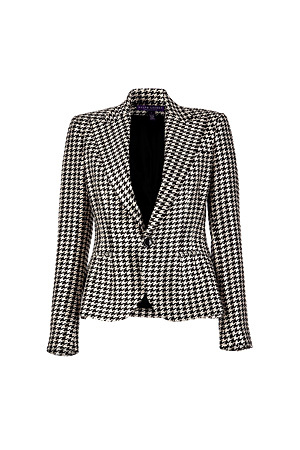 The best pieces to buy in houndstooth are shift dresses, pencil skirts, cropped blazers, peacoats, and trousers - both flared and straight legged. Oh, and it’s perfect for this winter’s super trendy mod look. I recently bought a houndstooth shift dress from H&M and I love it. I went in today to inquire about the Versace for H&M collection (in Toronto stores November 19th) and noticed that almost all the houndstooth pieces were gone. There was only one dress left and it was in a size 14... So get it before it gone people! These puppies are in high demand. I love the pants from the first picture!